December 26, 2004: The Tsunami leaves Sri Lanka in chaos and confusion. Local NGOs (Non-Governmental Organisations) and independent animal welfare activists quickly band together under the umbrella of the “Tsunami People-Animal Welfare Coalition.” Within a few days, funds from Animal People News, soon followed by donations from other organisations, provides the means to assemble initial response veterinary teams. These teams are dispatched throughout the tsunami areas to assess the state of animals and provide necessary emergency triage treatment. What they found were either animals dead or animals alive but in distress due to lack of drinkable water, food, loss of community and people. As people began to grasp what had happened, chaos turned to panic. With villages and communities wiped out, the ever-present community dogs became high profile. 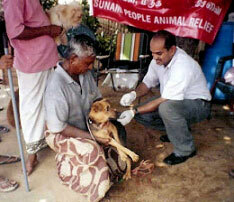 The perception of the threat of a rabies breakout as a result of the tsunami began to gain momentum among Sri Lankans. This misguided fear led to a kneejerk reaction by the government and local municipalities to threaten mass killings. Red collared dogs were seen everywhere and brought a reassuring calm, but it did not last. With an estimated 100,000 owned and community dogs having been displaced, without homes, owners, or communities, the misguided reason now to cull dogs was to manage the population. Complaints about dogs and their natural behaviour of fighting for food, mates, and territory were all considered signs of rabies. In the refugee camps, families were living tent-peg to tent-peg, often without acceptable sanitation. In such intensive living conditions, dog welfare is often compromised and risk of disease and injury is amplified. The refugee camps also lacked the quiet out-of-the-way hiding places for mother dogs to have their litters, and in the high density camps, a mother’s natural defense of her pups was being seen as aggressive and dangerous. The last thing needed in the battered disaster zones was a new flock of puppies. The international community was watching every developing detail in the tsunami-affected countries, and Sri Lanka was now in the spotlight. In an effort to provide solutions other than culling, animal welfare organisations joined forces and convinced the government to consider Catch-Neuter-Vaccinate-Release (CNVR) as a humane method of managing the populations of dogs, while at the same time minimizing the threat of rabies and reducing dog bites, especially among children. Vaccination alone does not prevent new litters of puppies, who then also need to be vaccinated. Furthermore, killing has been proven repeatedly not to work because nature abhors a vacuum and other dogs quickly move in to fill the void. Nature may also respond by increasing litter sizes. Sterilisation and vaccination, making use of dogs’ natural territorial nature, is a humane solution to creating a stable and healthy animal population of owned, community, and stray dogs. The Tsunami Memorial Animal Welfare Trust was established in March 2005 to work in tsunami-affected areas and refugee camps specifically; the legacy from the initial response supported by Animal People News, HSI, WSPA, and others was born. In 2006 the name was changed to the Tsunami Animal-People Alliance (TAPA) to better emphasize the link between the welfare of the animals and the welfare of the people. Through TAPA and its trained Sri Lanka team, the work will continue, grow, and strengthen the animal welfare movement in Sri Lanka, while improving the environment for both people and animals. The indigenous TAPA team delivers field clinic services, including vaccination, sterilisation, and general treatment in tsunami-affected areas and refugee settlements during the recovery, which has been estimated will take up to ten years. The impact of the field clinic is wide-reaching, touching both the individual dog or cat, as well as improving the environment for all dogs and cats in Sri Lanka by raising community awareness of the strong links between people and animals.